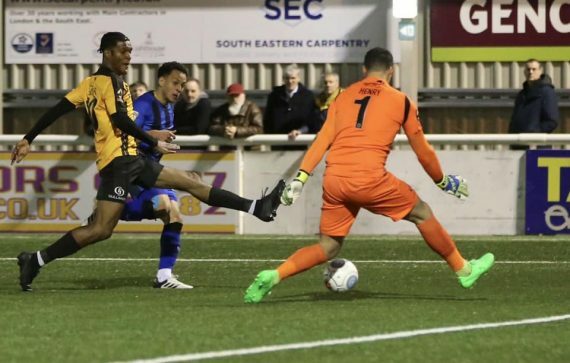 Maidstone United forget about their relegation toils for one night as they edged past a young Gillingham side and into the Kent Senior Cup Final after a penalty shootout at the Gallagher Stadium. The Gills were in the lead twice through Tahvon Campbell’s smart finish from Regan Charles Cook’s pull back and Elliott List who outpaced a static home defence to score with some ease, only for first Elliott Romain to power home a header for 1-1 and then Justin Amaluzor levelled for the Stones drilling past an exposed Tom Hadler to force the shoot out. And after List and the unlucky Billy King missed in the shootout, it was left to substitute Blair Turgott to hammer the ball past Hadler in the Gills goal to send Maidstone through to face Bromley in the Final at the end of April. It was tough on the Gills keeper who had pulled off the save of the night to deny Amaluzor’s penalty, though it mustn’t be forgotten that Stones keeper Dion-Curtis Henry did well to palm List’s effort away before watching King’s effort disappear into the crowd. MAIDSTONE UNITED – Curtis-Henry, Meredith, De Havilland, Davies, Romain, Paxman (Turgott 84), Amaluzor, Wishart, Donnellan, Phillips (Powell 85), Edobar. Subs not used – Strizovic, Walton, Richards. Goals: Romain (18), Amaluzor (47). GILLINGHAM – Hadler, Chapman, Lacey, Tucker, Garmston, Oldaker, Rees, Charles-Cook, King, List, Campbell. Subs not used – Catherall, Simpson, Woods, Stevenson, Morrell. Goals: Rees (8), List (38). Picture supplied by Gillingham Football Club. This entry was posted	on Tuesday, March 19th, 2019 at 9:45 pm	and is filed under Featured, Football, Gillingham. You can follow any responses to this entry through the RSS 2.0 feed. Both comments and pings are currently closed.